It's easy for people to get wrapped up in getting upcoming work done that they lose sight of finishing the present ones. Instead of worrying about things that are beyond your control, focus on what directly affects your work right now. Having a grip on the responsibilites you have now can help you manage any additional ones that come along. Even though you want to prove that you can handle your current workload and more, you don't have to be in over your head to impress your superiors. This approach of biting off more than you can chew can instead cause you to look unorganized and unable to balance priorities. Proper prioritizing is important to working efficiently. Sometimes, what needs to be finished first doesn't have to be started first. Then again, when bigger projects are put ahead of the smaller ones due first, things can get pushed back even further when deadlines catch up to you. 1) Keep Track of Your Assignments. 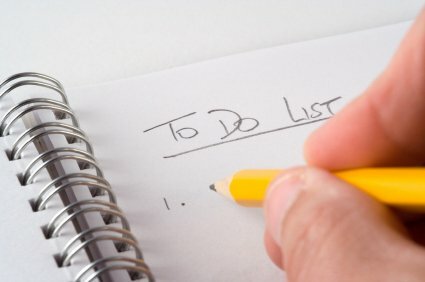 Whether you prefer to type them into a computer program or write them down with a pen and paper, having a list of your tasks outlined in front of you really helps in getting them done. You can stay on track easier and tackle each task based on priority. 2) Start Each Day With This List. This list will help maintain focus on a daily basis. Continue to add projets to it but remember to list them according to importance so for each assignment completed you can move right on to the next one. 3) Think Before Saying, "Yes." Making commitments that you aren't initially 100% sure you can follow-through with will only make things more difficult for yourself. It's better to say "no" in the beginning and later be able to help out than be expected to the entire time only to cause disappointment. 4) Take Control of Your Time Management. If you tend to just make deadlines every time, improving your time management can greatly help your work productivity. Instead of getting by, you can breeze through work and accomplish them with ease. Often, when you're racing against the clock, your work suffers. Make sure that you're devoting ample time to your work on a daily basis so that you aren't scrambling up to the last minute.